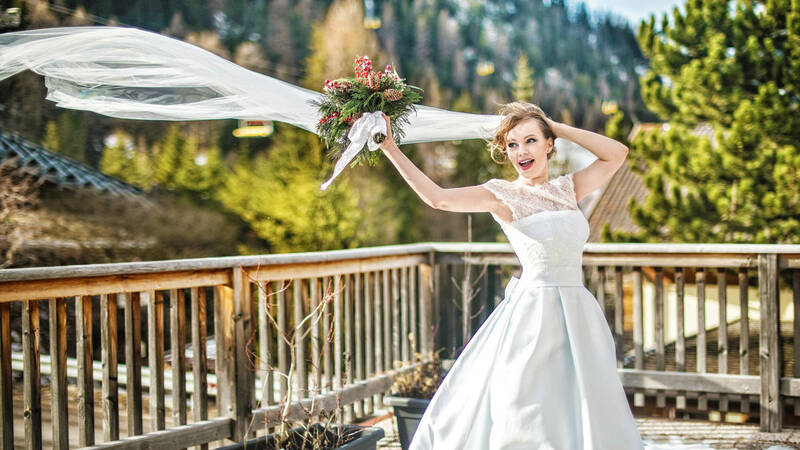 In this article I will talk about one of my most favorite weddings, held on the eve of Christmas, in one of the best ski resorts in Italy, in Corvara in Badia, on the very tops of the Alps, called the Dolomites. The bride Svetlana is a desperate mountain skier, she wanted to arrange a wedding in winter, and certainly in the mountains, on a snow-capped summit, and again I performed at this wedding as a wedding photographer and as the wedding planner. I liked Svetlana very much by correspondence, and when I met her on the eve of the wedding, when I arrived at the wedding location in Trentino Alto Adige, she just fascinated me, because she is a sweet and pleasant girl who radiates light and happiness. She was the most desperate bride; despite a host of obstacles (such as the delay on the train from Verona to Bolzano, the arrival in Venice on December 31 an hour before the New Year, where it was impossible to find a taxi, and many other surprises) Svetlana was not upset and with a smile overcame them, encouraging her husband)) Many of my couples subsequently remain friends for me, to whom I can make a request, or for whom I will be pleased to do any feasible service; but this couple, Svetlana and Artem, became special for me. Upon our arrival, Svetlana and Artem fed us with a delicious homemade dinner, we was frozen and tired from the road, and left us to spend the night in their apartments; and the next morning we started to collect the bride and make preparations for the photo session. During the preparations came friends of Svetlana and Artem, they were supposed to arrive the day before, but lost somewhere in the mountain passes, and could reach us only in the morning. The bride's preparations were held in a wonderful atmosphere, there was a feeling that we had known each other for many years. While the stylist was preparing the bride, I photographed the dress, rings, conifer-berry bridal bouquet of the bride, which I made myself and brought for her with me, and then we staged a small photo session on the terrace. Svetlana boldly stepped outside in one wedding dress, after taking a cognac, and under a heavy wind we took several pictures (the weather turned out to be sunny, but very windy). And then we went with all the fun company on the cable-railway to shoot on the highest peak. It was truly a dizzying climbing))) At the very top, we were able to stay for about twenty minutes, because were a strong wind, and my photo camera began to freeze, so after we photographed, we went back down to continue the photosession in the forest. In the evening took place the ceremony, it was held in a cozy and authentic Tyrolean restaurant, a real Tyrolean chalet, with a stunning local Tyrolean cuisine and an appropriate atmosphere. The holiday ended late, but upon returning to the apartment we continued it, so it was a pleasant and cheerful company! Despite the cold and icy stormy wind, this wedding remained in my memory the warmest and heartiest!